With its BMX-theme, the “Mad Max”-like postapocalyptic world, the awesome old-school synthesizer-score and that great, corny title song, “Turbo Kid” looks, sound and feels like a movie from the 80s that somehow got lost and forgotten, only to now suddenly reappear again – which is no small feat. For kids of the 80s like myself, this should prove to be a hilarious, cool and utterly brilliant study in nostalgia – as least if you’ve got nothing against splatter and gore. I fell in love with the movie pretty much on first sight. Setting the movie in the postapocalyptic world of the “distant future of 1997”, the BMX-action (which, if you think about it, actually makes a lot of sense in that setting; it definitely seems more logical than to hunt for every last drop of fuel just to get the cars running), the typical-of-the-80s title song… as they say in “Jerry Maguire”, “Turbo Kid” had me at hello. However, as much as I loved the beginning, it really starts to fly once the Kid meets Apple. She’s such a great, bubbly character, always enthusiastic about everything. Every scene with her was a pure pleasure, and many of the biggest laughs of the film were due to her. On the one hand, it’s how the character is written, but one must also applaud Laurence Leboeuf for bringing her character to life so effortlessly, giving it her all, and emitting this incredible energy. Munro Chambers also is great as The Kid (even though Laurence Leboeuf steals the show in every scene she’s in), and Michael Ironside plays a great, appropriately over-the-top villain. Apart from Apple, the real stars of the movie, however, are the script, the directing, and the overall style and atmosphere of the piece. “Turbo Kid” is incredibly funny, but that’s not just due to simple gags (even though you’ll find those, too). Much of the humor stems from nostalgia, the characters and their interactions, as well as the overall tone of the film. The splatter/gore-effects are great too, offering some cool, original and memorable kills that I won’t forget anytime soon, with the umbrella and the subsequent sweet and romantic scene a particular standout. And – apart from the splatter – I once again have to applaud them for making this feel like a movie that was actually shot in the 80s. There are many allusions to this time period, and I also really loved their fictional superhero “Turbo Rider” who was so believable that I ended up googling if such an action figure actually existed in the real world. If there’s one complaint, it’s that I’m a little torn on the ending. As much as I applaud them for the direction that they took, there’s a part of me that would have preferred a different outcome. 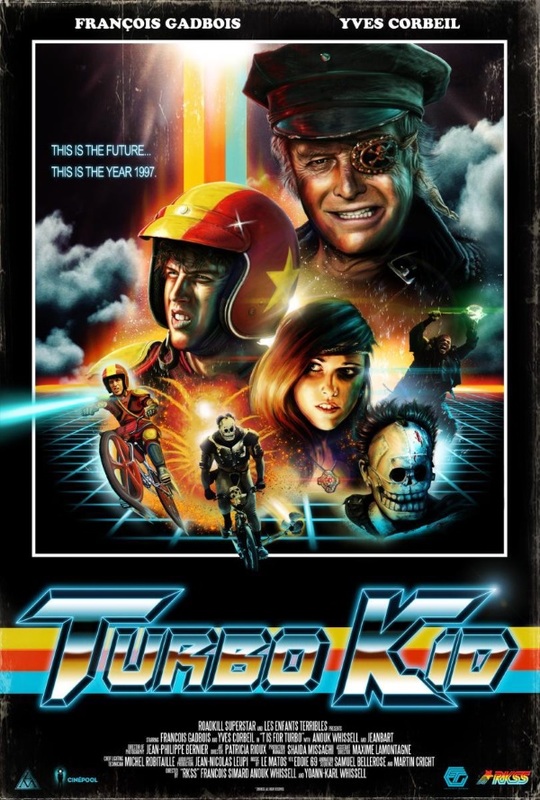 Despite that little nitpick, “Turbo Kid” was my highlight of this years /slash Filmfestival, and I can’t wait to get my hands on the Blu-Ray when it’s released over here in the middle of november (and the soundtrack would be an instabuy too, if they should ever release it digitally or – preferably – on CD; Vinyl is a little too retro even for my taste). “Turbo Kid” is an absolute blast (from the past). It’s funny, brilliant, cool, delightful, and incredibly entertaining. If, like me, you’re a kid of the 80s, then I highly recommend you dust off your BMX-bike and join Turbo Kid on this nostalgic trip to the futuristic and postapocalyptic wasteland of 1997! This entry was posted in /slash, movie reviews, new releases and tagged /slash, /slash 2015, action, Anouk Whissell, canada, François Simard, Laurence Leboeuf, Michael Ironside, Munro Chambers, new zealand, Turbo Kid, Yoann-Karl Whissell. Bookmark the permalink.